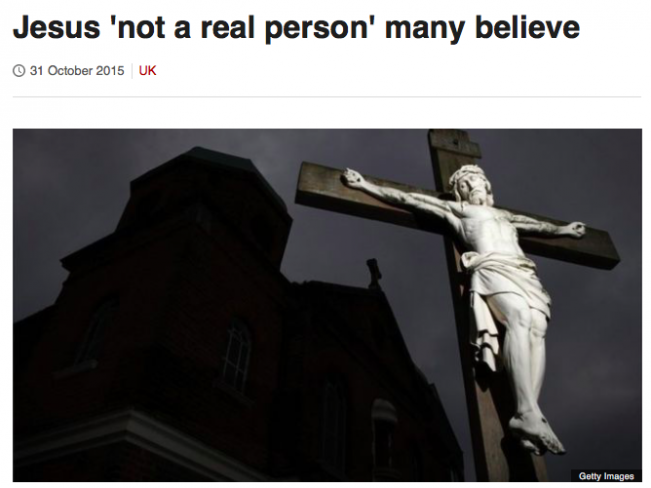 According to a Church of England survey, 40% of people in England do not believe Jesus was a real person. Strange as it may seem, the man who split time in half (B.C./A.D.) and whose legacy led to the global spread of an entire religion is seen by some as a fictional character. A similar Ipsos MORI poll carried out in 2011 revealed similar results. It found that UK Christians are overwhelmingly secular in their attitudes on a range of issues from gay rights to religion in public life. Listen to the news, and they’ll tell you that “attitudes are changing”. In other words, society is progressing and moving more towards tolerance and secularisation. They’re right. But why? Is it that the world is becoming ever more enlightened and putting away childish things, like superstitious beliefs in God? Or is that the world is largely ignorant about the nature of God, the truth of his word and the essence of faith? Does this strike you as the reasoned response of someone objectively appraising the testimony of Scripture? Let’s take this “argument” apart. Anonymous? The writings aren’t anonymous. Aside from the book of Hebrews, it’s difficult to think of many books where the author is completely unknown. The four gospels were all written by eye-witnesses, which is more than can be said for a lot of what we take as fact today. Delayed? In comparison to other ancient texts, the gospels were written extraordinarily close to the events they describe. In fact, the apostle Paul references 500 witnesses of the resurrection and tells his readers to ask them what they saw, since most of them were still alive. Spin? What evidence do you suppose there is that people “put their own spin” on subsequent translations? The idea that the New Testament has been altered over time has no basis in fact. Rather, the huge volume of available manuscripts makes it relatively simple to cross reference and check for “Chinese Whisper” syndrome. Ignorant? Use of the term “ignorant” is highly misleading. Christ’s contemporaries had doctors, lawyers, philosophers, tax officials and business leaders. These were not backward simpletons who were unable to discern illusion from reality. In fact, when Christ appeared to Thomas, we’re told that while Thomas believed, “some doubted”. Far from formulating a rational objection to the Christian faith, unbelievers often assert statements to be true, rather than presenting a coherent argument as to why. The Christian faith is declining in the UK, but it’s not through an increase in rational discourse; it’s through a conscious rejection of the gospel. The unbeliever consciously rejects the word of God, no matter what clever arguments he concocts to justify it. The believer therefore has a responsibility to adequately answer legitimate questions and objections (see 1 Peter 3:15). Some people are genuinely searching for answers, but will they find them through us? How prepared are you to contend earnestly for the faith which was once for all delivered to the saints (Jude 1:3)? ← Christmas by your rules…?